The old expression, “The kitchen is the heart and soul of your home” has never been more true than in 2017. With the changes in our lifestyles, the kitchen is no longer simply the place where mom makes dinner and does the dishes afterwards. It’s a place where the family gathers to sit and chat. It’s a place where Billy does his homework and Dad pays the bills. It’s also a place where Sam and Jen help cook dinner for the the dinner party on Saturday evening. The fact is, how we use our kitchen has really changed. So, how do we remodel our new kitchen to incorporate these changes, or, to use a different word, trends? When we talk about trends, we’re not talking about what paint color is hot this year. We’re talking about real changes that add value to your kitchen from a usability perspective. We’re also talking about realism here as well. 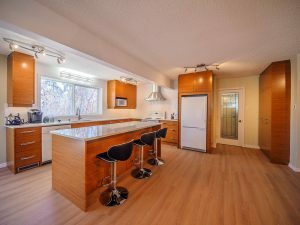 I know that the one million dollar kitchen remodel in that mansion in California looks great, but really, it’s not that practical here in Edmonton. Here are some things you should pay attention to in your 2017 kitchen remodel. I remember going to my grandmother’s house and having dinner 30 years ago. In the kitchen (and dining room) there was a single light fixture that lit the area up, and that light fixture was a large globe, the size of a basketball. Many homes still have that lighting setup today. Let me tell you, there is a much, much better option in 2017. Now, LEDs have been around for a few years, but it’s only been the last couple of year that they’ve become the go to lighting option for…well…just about everything. The cost of them has come down and they provide a nice comfortable light. In the kitchen, they can be placed over the main work areas, such as the sink or stove, used as general lighting (replacing those basketball globes) or, mounted as strips underneath your upper cabinets to provide lighting for the whole counter top (a great thing when you want to make a late night sandwich and not turn on all of the kitchen lights). And hey, if it’s your thing, they can even change the color of the lighting too, going from white to yellow, to red to blue. Going back to my grandmother’s house, I can still picture her kitchen cabinets. Most of the lower cabinets were the typical one drawer and a door design and the uppers didn’t go to the ceiling. I recall many times my grandmother asking me to take out a crockpot or a larger frying pan and having to remove half of the contents of a cabinet just to pull it out. It was then that we discovered the wonderful treasures that had been buried in the very back of the cabinets and forgotten about for months, sometimes years. I also remember grandma getting up on a ladder to clean the top of the upper cabinets. The dust, mixed with the grease from cooking, made for cleaning them a long and difficult process. Fast forward to now. Storage and organization have become just as important as how the cabinets look. Drawers glide effortlessly and there are more of them, to store the small kitchen appliances that we’ve been slowly collecting over the years. As well, they can come with full extension rails so you’ll always know what’s in the very back of a drawer, and, they can also come with soft close hardware…no more slamming the drawers closed. 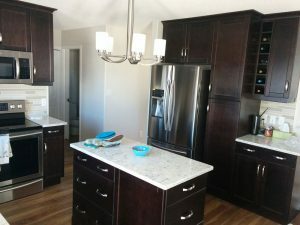 As well, cabinet layouts often include incorporating an island, both for additional storage as well as more work space. Sometimes, this is achieved by removing a wall ( or three) to open up space between the dining room/living room and kitchen. No more doing your baking on the dining room table. Add in a small sink and the island truly becomes an island unto itself. Materials that look good…..and wear well. Luxury Vinyl Tile looks like the real thing, but it’s a lot warmer on your toes. Do you remember linoleum? It looked okay the day it was installed but quickly looked dated and even worn after a short period of time. Again, my grandmother’s house had white linoleum with blue…I want to say flowers, but it was some kind of blue pattern. I also remember the lino curling up at the seams and places where there we marks in the floor from someone dropping a knife or a fork. Modern laminate counter tops look amazing. For counter tops, quartz has become the ‘must-have’ in most kitchens. It looks great and it doesn’t need the upkeep that granite does. Although quartz can be a pricier option, the cost is better than it has ever been and your choices in color are almost endless. Having said that, laminate counter tops have never looked better. 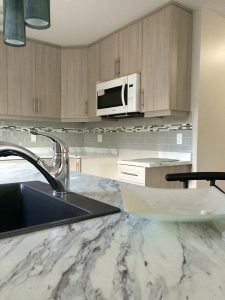 They are more affordable than a solid surface counter top and have come a long way from the five colors that seemed to be installed in every home in Edmonton. The kitchen on the right, for example, has a beautiful laminate counter top that looks like stone. Without a doubt, the biggest trend we’re seeing in just about every renovation is accessibility and these changes are starting to happen in the kitchen. 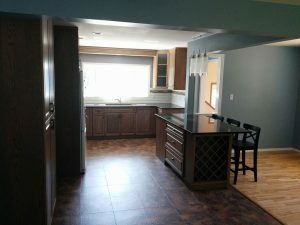 While barrier free kitchens are usually only being renovated for people that require them, we are starting to see some of the design elements come into play in a lot of kitchens we renovate. And why not? Accessible doesn’t mean “for people in a wheelchair.” It means something that functional for everyone. We’re seeing more drawers in the base cabinets because it’s easier to pull out a drawer than get on your hands and knees to take something out of the cupboard. Wall ovens with side opening doors mean you don’t have to throw your back out trying to lift that turkey out of the oven. Even something simple as more space between the island and the cabinets making it easy to maneuver around in the kitchen. So, if you’re planning on renovating your kitchen this year, remember that your kitchen is your home’s heart and soul. Plan your renovation to include some of these elements so that heart beats strong and the soul feels good.